Everything moves in It Ain’t What You Make It’s What Makes You Do It, a quirky funhouse of a show currently spinning, tapping, and pounding away at Valentine. And almost everything makes noise — a lot of noise. If you want to finish up the 2013–14 art season with a bang, this is the place to go. Fred Valentine, the artist, gallery director and freshly minted Guggenheim fellow, calls It Ain’t What You Make a “nod and a tribute” to the enigmatic artist Dennis Oppenheim, who was born in 1938 and died of liver cancer in 2011. The title of the show comes from the song that accompanies Oppenheim’s kinetic sculpture “Theme For A Major Hit,” the centerpiece (and biggest noisemaker) of the exhibition. Like Chris Burden, the performance artist whose retrospective last fall filled all five floors of the New Museum, Oppenheim began his career exploring the aesthetic of self-inflicted pain, and later moved on to large-scale sculpture that straddled art, architecture and landscape design. But Oppenheim’s body-centric works, which he performed in the late 1960s and early ’70s, were quieter and more introspective than Burden’s sensationalist endurance pieces and political statements, which involved, among other things, imprisoning himself in a locker for five days, getting shot by a rifle and crucified on the roof of a Volkswagen. Instead, Oppenheim’s performances included grasping handfuls of poison oak, lying in the sun for five hours at Jones Beach until he received a second-degree burn, and being pelted with rocks. By the mid-’70s he was making mechanized objects such as “Two Right Feet for Sebastian” (1974), in which a pair of boots kick the gallery walls sixty times a minute, and “Theme For A Major Hit” (also 1974), the current showstopper at Valentine. “Theme For A Major Hit” consists of a marionette — its bronze-painted head is a self-portrait — decked out in a silver suit and black turtleneck. 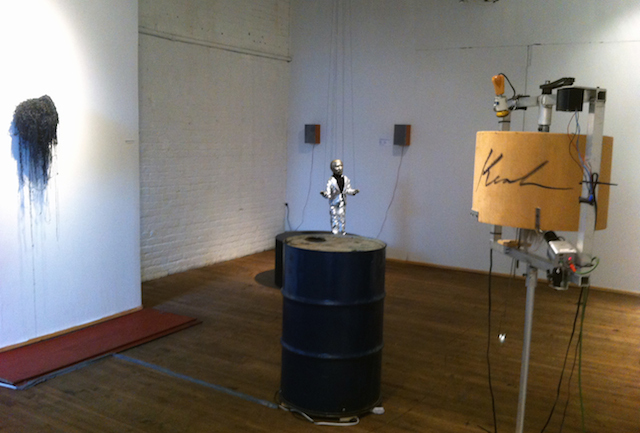 The puppet, operated by a motor clamped to the ceiling, taps (or, rather, clops) on a circular platform to a two-hour-long recording of “It Ain’t What You Make It’s What Makes You Do It,” a song (which, as mentioned above, lends the exhibition its title) written by Oppenheim and performed with a band that included Jim Ballard, Roger Welch, Bill Beckley, Connie Beckley, Christa Maiwold, John Shole and Diego Cortez. And that’s all it does. Valentine pointed out that the common thread among the majority of the artists — aside from a connection to Oppenheim (the exhibition announcement states that the invited artists “knew him, worked with him or were touched in some way by his work”) — is the inordinate amount of time they spent planning and executing, with a remarkable degree of craft, a mechanism that accomplishes a single task, and a rather simplistic one at that. This is particularly the case with Gregory Barsimian’s “Level” (2002), a length of polished wood bisected by two miniature lampposts with the sculpted figurine of a neighborhood drunk between them. Its action is the most elemental in the show: tilting like a teeter-totter, it pitches the drunk from one lamppost to the other. Another, far more complex work by Barsimian is “Barrel 52” (2013), in which sequential sculptures, illuminated by a strobe light, spin inside an oil drum. If you look into one of the two circular apertures on the top of the drum, you will see a hand catching a green globule that rises like a bubble from the bottom of the barrel. 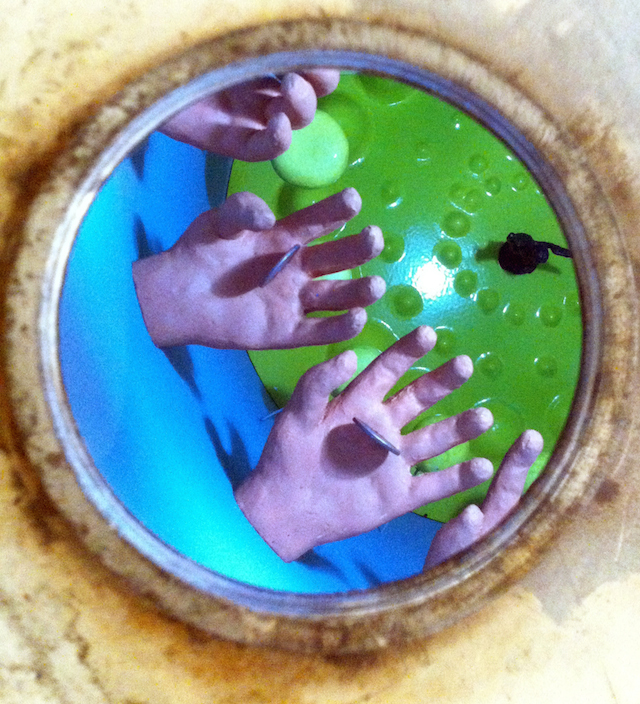 The hand presses the blob, with its connotations of crude oil, into a coin, which it tosses upward. The reductiveness of the work’s politics, however, is overridden by the mesmerizing effect of its candy-colored, three-dimensional animation springing to life before your eyes. 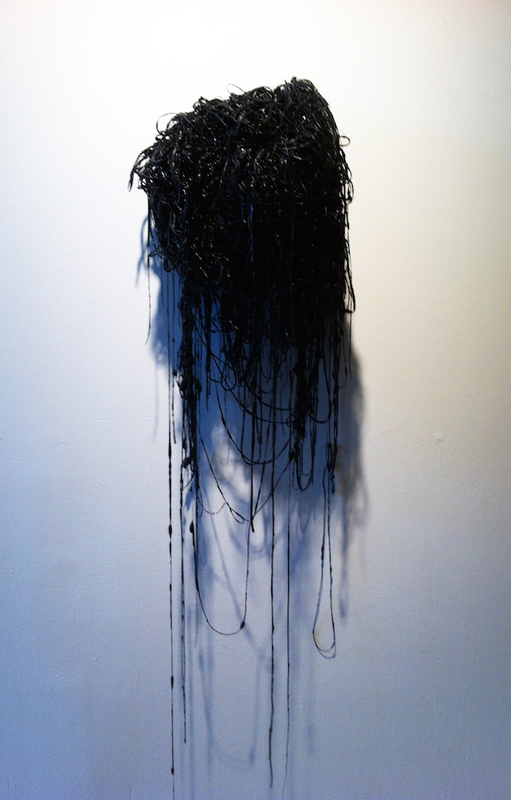 Crude oil is also evoked in Charlotte Becket’s “Self-Portrait” (2014), an artfully creepy mass of black silicone hanging in long, glistening strands, as if it had been pulled from a supertanker spill. If that weren’t enough, the top of the slick black mass also moves, slowly and silently, as if it were a jellyfish stirring from a primordial slumber or chewing its own head. 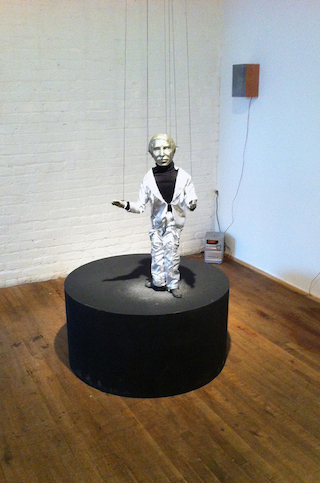 There is a third self-portrait in the show, along with Becket’s and Oppenheim’s, by Jeffrey Allen Price. A former assistant to Oppenheim, Price made his comic-Picassoid “Potato Auto-Portrait (carved in 2004),” as the title states, ten years ago, and it has been shrinking ever since; consequently, this piece is also moving, albeit at a glacial pace. Depending on how you count, Guy Ben-Ner’s two videos, Berkeley’s Island (1999) and Wild Boy (2004), can be considered the fourth and fifth self-portraits in the exhibition, since they feature the artist and his family in DIY fantasy films staged in his home. The movies capture Oppenheim’s inborn zaniness (Berkeley’s Island takes place on a pile of sand in the middle of Ben-Ner’s kitchen) as well as his esprit de art, which sometimes turned intimate sensations into public displays. With “On the Jarry Road” (no date), Mark Esper — another of Oppenheim’s former assistants — has melded Marcel Duchamp’s “Bicycle Wheel” (1913) with a literal reading of a story written by Alfred Jarry, the pataphyisical playwright and creator of Père Ubu, about a team of five bicyclists in a race with a locomotive. In the sculpture, the rim of the bicycle wheel, which is carved out of maple, is edged with a tiny railroad track over which a tiny model engine runs, with the words “DUCHAMP LINE” emblazoned on its side. Early modernism is also recalled, at least to my eye, in Mary Zeigler’s “Site” (2002), in which magnets agitate a thin metal rod and miscellaneous metal shavings inside of a frame attached to a milky-white disk, echoing the abstract animations of Hans Richter or the Suprematist designs of Lyubov Popova. Nestled in the same spotlit stretch of corridor that she occupied during a three-person show (with Patricia Satterlee and David Henderson) that I reviewed in March, Jude Tallichet attempts to out-blast Oppenheim’s cacophonous marionette with “Time of the Season” (2014), a collection of model cars molded out of brightly painted aluminum foil. A loudspeaker is hidden inside each car, and when the audio component switches on — an electronic version of “Time of the Season,” the 1968 pop hit by the Zombies — the speakers emit puffs of air that pop a balled-up piece of foil, also concealed inside the car, upward. Consequently, the cars bop all over the place in time with the music, partially demolishing themselves in the process. This show presents kinetic art in the quaintest sense of the term. Everything is analogue — set into motion by motors, magnets, loudspeakers or the force of gravity. Most of the pieces could have been built in the 1960s by Jean Tinguely, the patron saint of self-destructive sculpture-machines. One exception is Jon Kessler’s “The Accidental Tourist” (2011), which employs a live video feed aimed at the interior of a rotating drum, where a three-dimensional, bearded and hairy Tolkien-esque figure is suspended in front of a moving landscape. Recorded at close range, the figure’s blank stare confronts us from a flatscreen monitor that sprinkles a gloss of 21st-century consumer technology over what is essentially a one-note tour de force. These elaborately conceived systems, realized in the service of absolute absurdity, revolve around an inherent illogic that militates against their usefulness as wider metaphors. Unlike Tinguely’s infamous “Homage to New York” (1960), which acted out the endgame of industrialized civilization in the shadow of the Bomb, these works make a virtue of an Ouroboros-like self-reflexivity, reveling in the preposterousness of eating their own tail, claiming no meaning beyond their own actions. What we do, with so much ambition, forethought and effort, they seem to say, is ultimately, irredeemably pointless: deal with it. 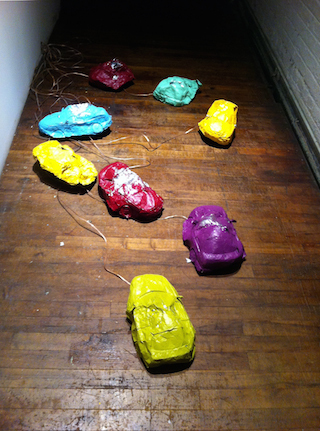 It Ain’t What You Make It’s What Makes You Do It continues at Valentine (464 Seneca Ave, Ridgewood, Queens) through June 8.